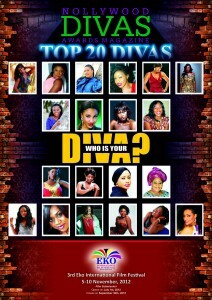 VOTE FOR THE NOLLYWOOD DIVA OF THE YEAR 2012! 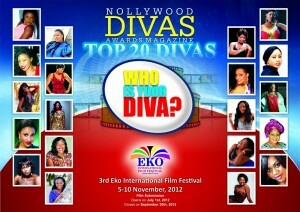 The annual Eko International Film Festival (EKOIFF), Nigeria’s leading international film festival is honoring Nollywood divas with the launch of the annual Nollywood Divas Awards to be unveiled at the 3rd Eko International Film Festival which opens on November 5, 2012, in the coastal mega city of Lagos in south western Nigeria. The Nollywood Divas Awards is a celebration of the accomplished actresses in Nollywood, the Nigerian film industry,” said Mr. Hope Obioma Opara, the President of Eko International Film Festival and CEO of Nollywood Divas Awards as he released the maiden NOLLYWOOD DIVAS AWARDS MAGAZINE ® with the announcement of the 20 nominees for the inaugural Nollywood Divas Awards in Lagos. The top nominees include the most popular Nigerian actress Genevieve Nnaji, multiple awards winning actresses Omotola Jalade-Ekeinde, Rita Dominic, Kate Henshaw, Stephanie Okereke-Idahosa, Omoni Oboli, Monilisa Chinda, Funke Akindele, Stella Damasus, Ini Edo, Mercy Johnson, Bimbo Akkintola, Nse Etim Ekpe, Uche Jumbo, Tonto Dike, Lillian Bach, Fathia Balogun, Ngozi Ezeonu, Joke Silva-Jacobs and Clarion Chukwurah who is the most accomplished Nigerian Nollywood diva to date. VOTING OPENS ON SEPTEMBER 1. You will soon receive the alert to vote on your mobile phones from September 1.